The supposedly invincible Hilux is said to be more comfortable and sophisticated than ever. How does it fare in the toughest of environments? Being known as a practically unbreakable, go-anywhere tool would be enough for most vehicles in the motoring world. The new Toyota Hilux, though, is attempting to have its cake and eat it by not only remaining as tough as they come, but also appealing to a much wider audience by adding a more comfortable ride, a more SUV-like driving experience, a higher-quality and more gadget-laden interior and a more economical engine. That's quite a brief – one with a significant dose of ambition, with Toyota aiming to develop a vehicle that you can enjoy and get the best out of without having to own a game reserve in Namibia. Ah, Namibia. The southern Africa country is the second least populated on earth (after Mongolia, fact fans) and, as such, is home to some extreme, isolated driving locations and conditions. You can go days being able to count other gravel road users without using all your fingers and toes, and you barely get past your thumb if you’re counting the number of houses you pass at the same time. Conveniently, Namibia is our venue to see if the Hilux is not only as indestructible as ever, but also more usable, maybe even enough to tempt you out of the industry’s three favourite letters at the moment: S, U and V.
Namibia is one of the 172 countries in which the Hilux is sold and one of the 110 countries that chief engineer Hiroki Nakajima has visited to find out how the 18 million Hilux buyers over the past 50 years or so use their vehicles and what more they wanted from them. Extra usability was the answer, perhaps because buyers are realising that they can combine their work vehicle with one for personal use if it is made nicer and more usable. This explains why, in recent years, we’ve seen so many more sophisticated new generations of pickups, such as the Nissan Navara, Mitsubishi L200, Ford Ranger and Volkswagen Amarok, and why the likes of Renault, Mercedes-Benz and the PSA Group are keen to get in on the act, with new models due in the coming months. In the UK in particular, pick-ups make for a very attractive choice where company car tax is concerned: £105 per month for a 40% tax payer, with an extra £50 for private fuel use on top. Make no mistake: these vehicles are no longer merely crude and workmanlike but are becoming serious and attractive alternatives to the established set. The Hilux has long been known as the king of the breed, but its rivals have now surpassed the existing model, on sale since 2004, in all areas apart from toughness. So, the new Hilux. Underpinning it is a ladder chassis that is claimed to be 20% stiffer than the previous Hilux’s. On that stiffer chassis sits a stronger body, with almost twice as many spot welds as it had before, and this is claimed to improve body control and the steering. The suspension – double wishbones up front and leaf springs at the rear – has also been overhauled for 20% greater wheel travel, which is said to boost ride comfort and off-road performance. All the other pick-up essentials have been addressed: a larger, reinforced cargo deck to carry 1055kg loads, the ability to tow up to 3.2 tonnes (rising to 3.5 tonnes by the end of the year) and plenty of different lockable covers to keep your load or luggage safe from prying eyes. Two-seat Single Cab, four-seat Extra Cab (they’re a cramped pair of rear seats, mind) and the most popular five-seat Double Cab bodies are offered. As for that more economical engine, it is a 148bhp 2.4-litre diesel, which replaces the 2.5 and 3.0 diesel engines found in the outgoing Hilux. It has more torque than the old 3.0 (295lb ft versus 253lb ft) and better economy (41.5mpg at its cleanest) than either of the previous engines. There’s a choice of six-speed manual or automatic gearboxes and the ability to switch between two and four-wheel drive, depending on the conditions, and a low-range mode in both. It’s the engine that makes the first impression as our journey starts in the small coastal city of Swakopmund. This diesel unit, as we will soon find out, turns out to be the most commercial vehicle-like aspect of the Hilux. It’s quite noisy at start-up, and although it is responsive – particularly in the mid-range, thanks to a healthy spread of torque – it lacks the hushed smoothness you’ll find in most large modern diesel vehicles. It’s good, but not quite as convincing as an SUV alternative, despite the improved suppression of unwanted noise, vibration and harshness. As for driving in the city, the Hilux doesn’t feel an overly big vehicle to place, not least because of a high driving position and good visibility, aided by chunky mirrors. The controls are nicely weighted and the clutch pedal is light and easy to use. 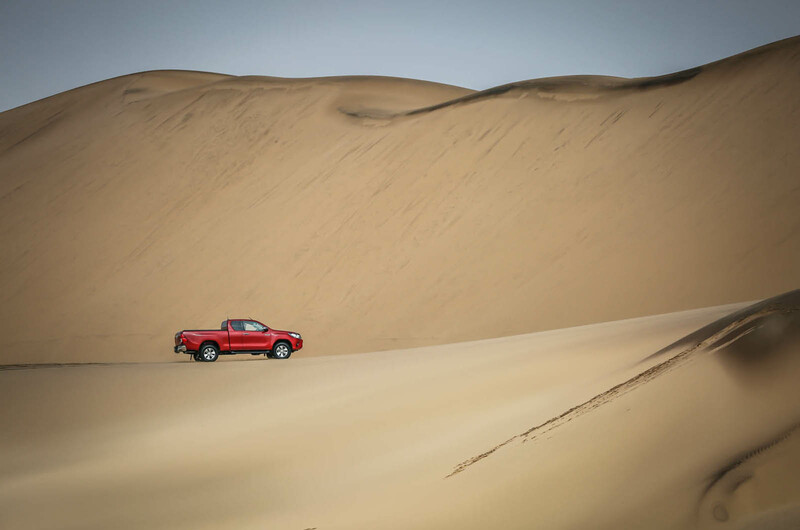 The paved urban streets of Swakopmund soon give way to gravel roads, which prompt a turn of the dial next to the steering wheel from rear-wheel drive to four-wheel drive, and soon the adventure really starts with a trip across some sand dunes. Clearly, this is not something that most Hilux buyers will ever do, but after some generally positive first impressions of how the new model performs in town, this is the first chance to see if the new Hilux is as tough as ever. 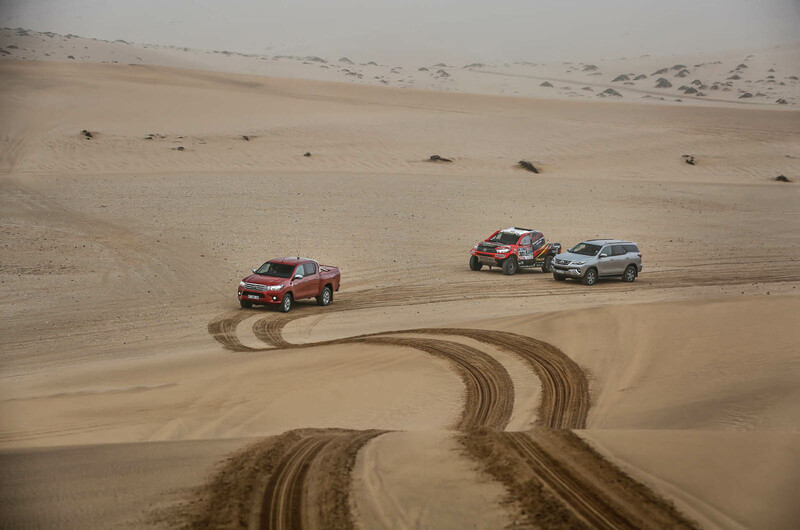 Before driving on the dunes, we let the air come out of each of the all-weather tyres for around 75sec to increase their surface area for driving on the sand. Next up is turning that dial once more to the right to switch the transmission from high-range four-wheel drive to low-range four-wheel drive. It looks like it will be easy to conquer the first steepish ascent on the dunes, but as I slide back down the hill for the third time, it is clear that this is not your typical off-road drive. A workman should not blame his tools. 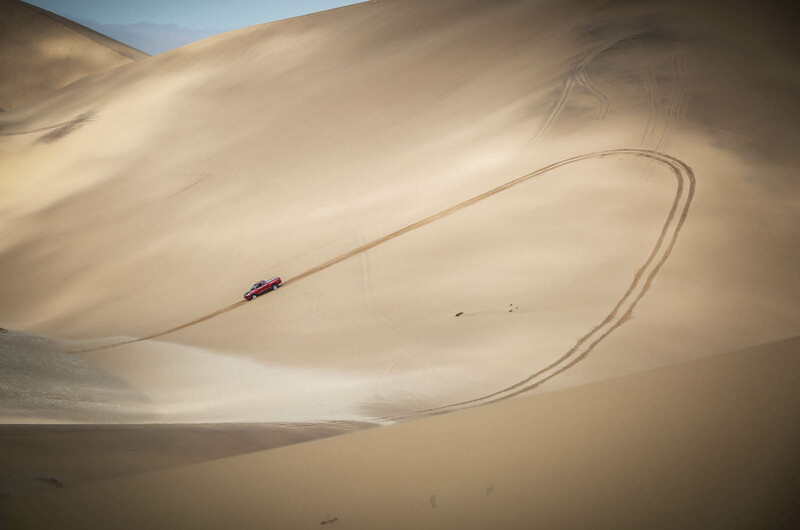 Quite quickly, it’s clear that you need a run-up and some momentum to conquer any steep sand dune ascent. You set off in second gear and then switch quickly into third before giving it plenty of revs to get up to the top. Even if you can only see sky as you reach the crest, don’t panic and slam on the brakes; you’ll only end up losing the momentum to conquer the climb. Yours truly is speaking from experience here. Instead, ease off the throttle but keep the momentum so that you crest the summit calmly enough to shift into first gear to start your steep downward trajectory, using the Hilux’s hill descent control if you don’t trust your right foot on the brake pedal. What fun, and what an impressive display from the Hilux. We tackled the dune in a Double Cab model with the standard six-speed manual gearbox, and it offers a slick, precise gearchange that is in no way van-like. Between our dune and our overnight stay inland in Namibgrens, there is a 200 mile drive through the barren Namib-Naukluft national park and a crossing the Tropic of Capricorn line at one point. The roads here are all gravel and sometimes quite rutted, so any cruising impressions are largely superfluous for those who drive in Europe. What can still be enjoyed in these conditions is the cabin. It’s a neat compromise of workmanlike functionality and everyday usability. The leather seats are comfy and offer good support. Certainly, you don’t feel like you’re sitting in a van. 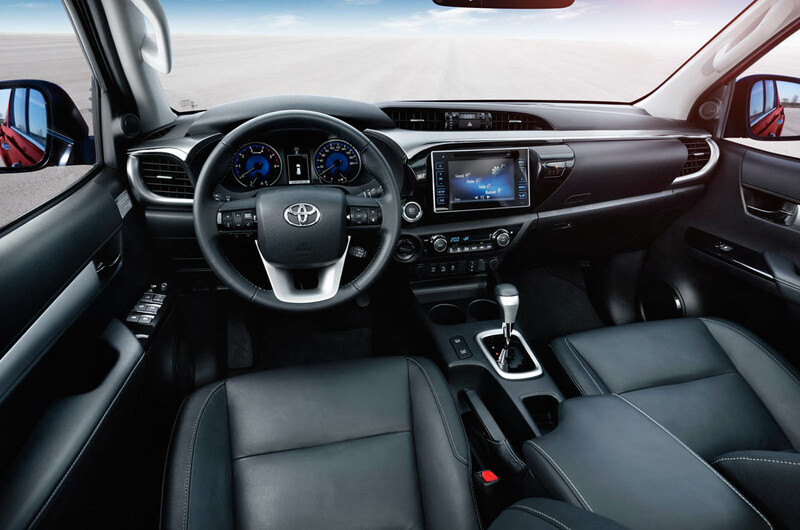 The interior features pleasingly tactile controls and an infotainment system that wouldn’t look out of place in any mainstream family Toyota, and the harder-wearing plastics on the dashboard and the door skins remind you that this is still a working vehicle. As if a further reminder were needed, the Hilux is put to work again the next morning in an extreme 26-mile off-road course. We switch to an automatic model, which makes life even easier than with the manual on the dunes. 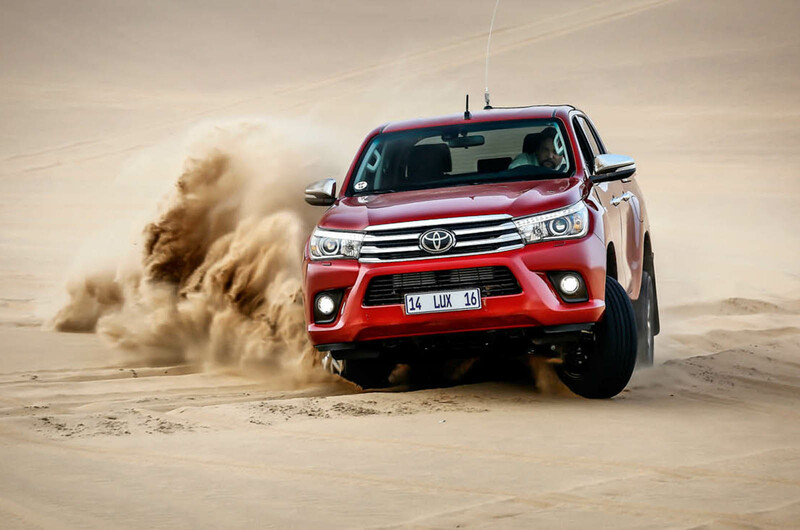 The Hilux is easy to control off-road and inspires confidence. The increased wheel travel allows for greater dips and lopsided pathways to be tackled, and with calm control of the pedals, the electronic gizmos can bring out the explorer in you. You also feel yourself rocking around less in the cabin due to the impressive body control. Another 150 miles or so of gravel roads follow as we work our way to the Namibian capital, Windhoek, and at last there’s a decent run of asphalt roads, where we get the best chance to feel how car-like the ride is. Although the ride is bumpy at lower speeds, it’s smooth and composed at higher speeds. It’s not the last word in sophistication, but it certainly doesn’t feel like that of a commercial vehicle. The steering also has plenty of weight, even if it has an artificial feel to it, but, again, it’s enough to almost convince you that you’re not in pick-up. We never get much of a chance to see how it handles, because the roads are almost universally straight, but the Hilux seems to turn in keenly enough on corners with gravel, and if you fancy a giggle with nothing loaded over the rear axle, there’s a chance of a wiggle from the tail. Destination reached in one piece, the journey has revealed the Hilux to be the best model in its class to drive, both on and off road. Whether you’d ever swap your SUV for one is another matter. Clearly, the Hilux is a pick-up, so it will never offer the SUV buyer the full security of a luggage compartment built into the main vehicle, but many more may well now be tempted to make that compromise, given how much vehicle you can get for your money. More still who use a pick-up for work and know how they work will consolidate their work and family vehicles into one Hilux-shaped vehicle, thanks to the progress that has been made to its everyday appeal and usability. There’s one fascinating subplot to consider with the Hilux before we leave Namibia, and that’s the eagerly anticipated Land Rover Defender replacement. The new Defender’s brief sounds pretty much identical to that of the Hilux: to be unbeatable off-road, but with broader everyday appeal. 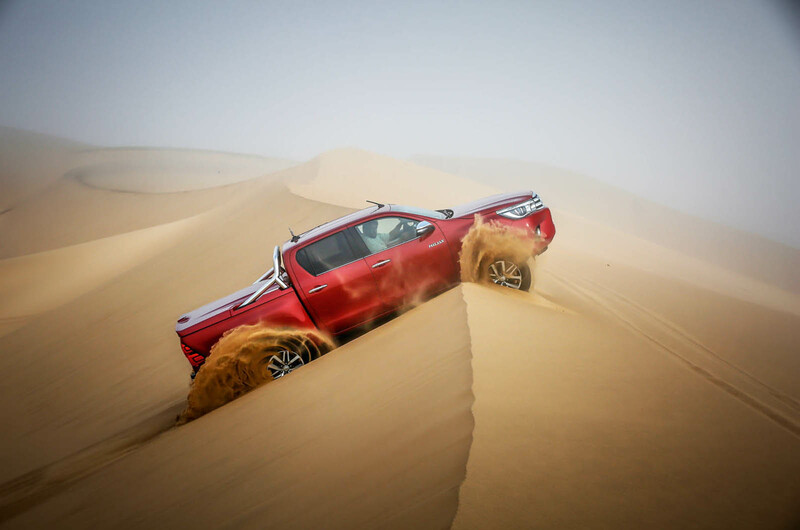 The Hilux and other Toyota off-roaders such as the Landcruiser are so popular in places like Namibia not only because of their true go-anywhere ability, but also because of their dependability. A flat tyre is typically as bad as reliability issues get (and the only issue we saw in any of the Hiluxes on the whole trip), and when you’re running a five-hectare farm in the middle of nowhere, that is welcome news. A trip to a local dealer just isn’t going to happen. And if it does go wrong? Everyone knows they don’t go wrong, but if they do, everyone here has one and parts are cheap and easy to come by. And that is what the new Defender is competing against. We’ve no doubt that it’ll be a peach off-road. But can it be reliable? Can it be easy to fix? How easy will parts be to come across? We’ll find out soon enough but, for now, the Hilux’s reign around the world continues, and more people than ever are going to get to enjoy it. The best 4x4 is the Nissan Patrol. The toughest environment is Afghan. A good workman blames his tools. What a stunning country. It reminds me of Australia.